For some, it’s playing games…. For some, it’s pamper sessions at the spa…. Well, we like to do these things too but first, WE EAT FOR FUN…..
Sunday afternoon at The Backyard Lagos….table for 4 (Me, Amaks, H-Baby and Sarah), Menus in hands…. I had the tall glass in the middle ‘Get a head’ just because it contains sauvignon blanc (French white wine) and you know everything French attracts me….I love this drink for it’s complexity, one minute I’m sipping this chic fruity drink and the next, it’s a sprite-like earthy mix, what tied it all together for me was the vodka because well, every drink tastes better with vodka in it! H-Baby had the Moscow mule (steel mug)….honestly, I pressured her into having this just so I could have a taste but my drink already took over my palate so I didn’t get much from it which is why I won’t speak on it or on the Tropicana (orange, pineapple and coconut cocktail) Amaks and Sarah had….but I heard no complains from them. Next….the moment I waited for from the second I woke up *drumroll* FOOD TIME! I ordered this pretty plate of skewers…. At first sight, I had mixed feelings as the skewers looked really small yet très chic. I instantly felt the need to order for fries even though I was just fussing about gaining weight. Thankfully, Amaks painfully rescued me in her firm teacher voice ‘why don’t you finish this first’ Like a kid denied icecream I started off with my first skewer which led to a great discovery….Halloumi + Pesto= Heaven! Halloumi is a type of cheese with a semi-soft texture and pesto is a basil leaf based sauce, now imagine jamming grilled cheese with basil flavor in your mouth….I’m going to stop there. Next, shrimp then chicken cooked to perfection Mediterranean style, made me wonder why I don’t cook with oregano often….yumminess! Definitely felt like we were having a feast because we practically shared everything, Sarah had one of my shrimps and loved it, Hadiza had a chunk of halloumi and I can’t remember what exactly she said but it was something good. I moved to Sarah’s beautiful plate….grilled lamb with fresh mint sauce….AMAZING! I recommend this for every meat lover; tender, juicy, flavorful and the mint sauce, if I had a bottle in my bag, I might have poured it in to take home *covering face and picking at her side of fries* All four of us agreed that this was superbe! Amaks’ plate next….Backyard wings with yoghurt dip My girl’s taste buds were on strike today because I thought these wings were ‘fire’ and she thought they weren’t, peep her hand gesture guys *laughs* The fact that the chef took his time to french them into lollipops had my heart stolen…I am big on spice so I didn’t bother with the yoghurt dip, lollipop straight in my mouth and BOOM! Explosion of flavor followed by tenderness of the meat as it peels right off the bone then the icing on the cake, crunchy cartilage….am I the only one that loves to eat those babies at the joints of chicken wings? Then there was H-Baby’s plate….Popcorn Chicken and Hummus with wedges I had the first popcorn chicken and thought ooo is that it? I guess I was expecting actual popcorn popping up somewhere inside the perfect looking balls. Then I skipped to the Hummus which is personally not one of my favorite things to eat, chick peas just have this rustic feel for me and when it comes to food taste, I tend to lean toward fancy *judge not* But as a hungry kid, I ate up my wedge scooping more of the hummus, maybe I might come to like it one day. Thought I might clean up my mouth with one last stick of popcorn chicken so back on it but this time with a healthy dip of the honey mustard sauce and I appreciated it more….needed to double check so I took the final stick….not bad at all! Yes, there’s no actual popcorn but the crunch on the outside definitely mimics a popcorn. 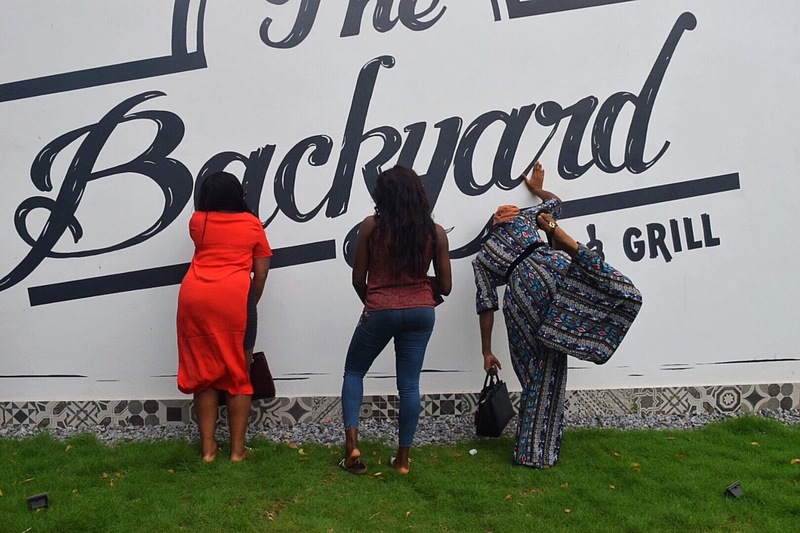 Apart from the food, I loved some details at the Backyard…..Whoever put this place together has a great mind! The bill tray or in this case Bill Basket….You see the fusion I am talking about? How does an old fashioned wooven basket become modern enough to be this colorful and versatile enough to serve bills? A Play Swing…. This sits right outside and naturally made me want to be a child again. Ofcourse there’s some subtle but interesting fusion thing going on here too….look at that rope-chain situation and the feel of the tied knot….RUSTIC….Yes I like rustic looks! Guess who had to indulge….H-Baby. After my experience here, I fully understand the name ‘BackYard’ and I hope everyone that visits gets the same thrills. It is located at 4B, Musa Yar’adua Street, VI Lagos. I tried it and I LOVED it! New Found Love: Fruitizz Lagos! Hmmm! You surely have a convert here. thanks for teaching me that Vodka tastes fine with any other drink. i will give it a try right away. Haha! Ready when you are…. Oh, the lamb! I had to stop myself from tasting the picture! Everything looked marvelous! The food looks soo good! I love eating for fun! It’s my favorite sport!